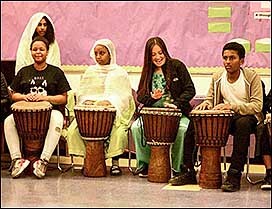 "Drums Not Guns 4 Culture"
Ocheami's Culture Club is a youth program for Middle and High School students. 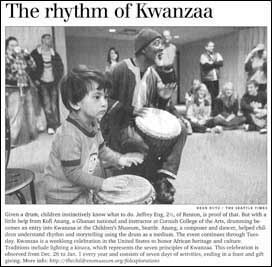 The program offers after school classes in Djembe Drums. The program is based in the Central District of Seattle. Participants perform at their school and at community events. This is Ocheami's Youth Violence Prevention Program. You may download the Ocheami Study Guide here. 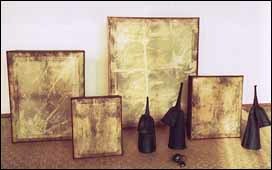 The 23 page Study Guide contains illustrations of some of the drums used in the progam as well as information about the country, people and culture of the West African nation of Ghana. This guide is offered at no cost or restriction when used in non-profit educational settings. Ocheami's Culture Club has been funded by the Seattle Department of Neighborhoods, Seattle Parks and Recreation, the Children's Museum and The Seattle Public Libray. Join Ocheami for an interactive experience that incorporates drumming,dancing,games and storytelling Ghana Style. Build community and have Fun, Fun, Fun as you learn. To support our programs please contact Ocheami Culture Club.